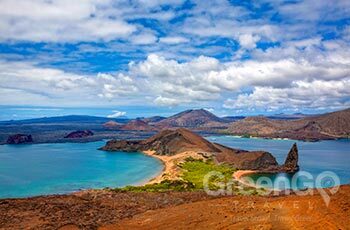 Found in the east coast of Santiago Bartholomew is a rather young island that displays some colorful sands in tints of red, black & other hues in its basaltic sand. A rather popular destination due to the scenic rock formation found in the island known as Pinnacle Rock & its surrounding scenery. 2 beaches are connected by a path,the southern beach is beautiful for walks and to observe stingrays and sharks, but swimming is prohibited here. A great location for snorkeling & spotting the tropical penguins, they hold a small colony in the island.